Z-ROC Dermatology, a premier dermatology clinic in Fort Lauderdale, received high patient satisfaction reviews from SurveyMonkey.com. FT. LAUDERDALE, Fla. - Aug. 26, 2015 - PRLog -- Fort Lauderdale is one of the best places to live in the nation for great year-round weather. However, constant exposure to the sun can cause several skincare issues. Z-ROC Dermatology is committed to helping patients look and feel their very best. The dermatology clinic in Fort Lauderdale recently received high patient satisfaction reviews from a leading online survey. According to SurveyMonkey.com’s 2015 mid year patient survey, 86.32% of 95 patients surveyed gave Z-ROC Dermatology an excellent rating. Patients who participated in the survey were asked five mandatory questions based on the service they received from Z-ROC Dermatology. Here were the results according to SurveyMonkey.com, the world’s most popular online survey software. · How would you rate the service you received? · How would you rate the service you received for setting appointments and checking in? · How would you rate your experience(s) with the doctor? · Which physician did you see? · How likely would you recommend Z-ROC Dermatology to a friend or colleague on a scale of 1-10? Ten means the highest and 1 means extremely unlikely. Z-ROC’s team of experienced and knowledgeable dermatologists in Fort Lauderdale can provide a variety of surgical and non-surgical skincare procedures including: Botox, skin cancer screenings, laser dermatology and Moh’s surgery in Fort Lauderdale. To learn more on how to help maintain your skin’s health, contact the dermatology clinic in Fort Lauderdale today at (954) 564-0040 or visit them online at http://zrocderm.com for more information. Z-ROC Dermatology is a state of the art dermatology clinic in Fort Lauderdale specializing in both surgical and non-surgical procedures including Mohs surgery, skin cancer detection, benign and malignant tumor resection, and other dermatologic issues such as acne, sun damage, eczema, psoriasis and wart removal. Call (954) 564-0040 today and schedule your appointment. 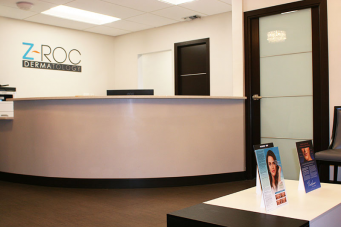 Z-ROC Dermatology is located at 2838 East Oakland Park Blvd 2nd Floor Fort Lauderdale, FL 33306. Schedule your Skin Cancer Screening Today!